Tucson health professional shares her experience with scam so you know what to watch out for. TUCSON, Ariz. — A nationwide scam claims you'll be arrested because you missed jury duty and you'll have to pay right away to escape it. You might think you can spot a gimmick a mile away, but a Tucson businesswoman fell for it last week. At the start of Denise Hausler's busy workday as a licensed professional counselor, she received a call that went to voicemail. The man identified her by name. "Hello, Ms. Hausler, this is Sgt. Adam with the Pima County Sheriff's Department warrant and citation division," the caller said. "Ma'am I'm calling in regards of an ongoing civil matter, ma'am." Hausler called him back right away. The imposter told her there were two federal warrants out for her arrest. Hausler panicked, fearing she would be arrested at her office in front of her clients. "And he said, 'We're going to send someone to arrest you unless you volunteer to come down to the sheriff's office off of Benson Highway,' which made sense because the sheriff's office is off of Benson Highway," she said. The caller told her if she drove down to the sheriff's department right away, she can post bond then appear before a judge who will probably give her the money back. "I'm panicked, I'm crying, I'm literally thanking this man for helping me not be arrested and being able to go home and not be detained and apologizing," she said. And he told her she can't get off the phone with him or talk to anyone. "'We're going to track you by phone until you get to this location because we don't want you to flee,' and I'm believing this," she said. Minutes later, the caller instructed her to first buy My Vanilla cards from Walmart — five of them — totaling $2,500 because the payment system was down at the sheriff's department and those specific cards are used for these types of cases. "I know, I know," she said. "In retrospect, I think, who am I? It doesn't even sound real. But when you're in it, he was so intimidating and so direct and telling me, 'We're going to come and detain you.' "
She bought the cards. The scammer then told her to read all the card numbers to him to verify they're valid. She did, but at that point she became suspicious and asked a stranger to call the sheriff's department. "And the man said, 'You're getting scammed. You need to get in there an undo your cards,' " she said. But it was too late. She could only recover less than a $1,000. Hausler wanted to share her story because the scam can be very believable. "I just don't want other people to fall for it. If you hear 'My Vanilla,' now I know the sheriff's department does not come to get you if you did miss jury duty. I didn't know that," said Hausler. KGUN called that same phone number left on Hausler's voicemail and it's the same voice saying it's the Pima County Sheriff's Department. These con artists used a spoofed phone number. The Arizona Attorney General says legitimate government offices will not threaten you with imprisonment or demand that you pay a debt immediately. Law enforcement and courts in southern Arizona have also been warning people not to fall for it. 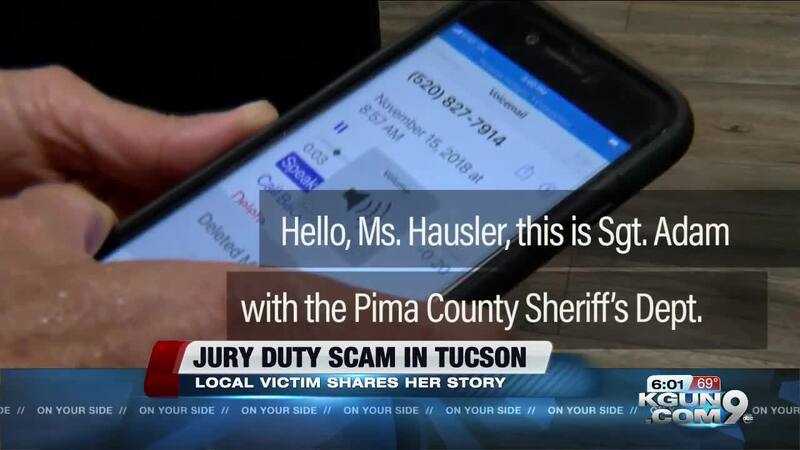 The Arizona Superior Court in Pima County has received several recent reports of jury service scams in Pima County. Officials say callers have also instructed people to go to the courthouse after purchasing Green Dot card(s). Because this is a nationwide issue, if you receive a call from a scammer please file an online report with the Federal Trade Commission by going to www.ftc.gov and following the "File a Consumer Complaint" link.